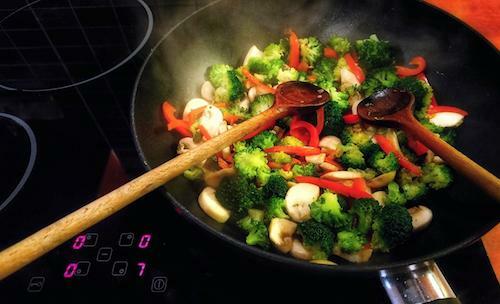 A quick and easy way to make a healthy dinner! Add any extra veggies you have in the fridge! Heat a sauté pan over medium heat and add just enough sesame oil to coat the bottom of the pan. Add the ginger, garlic and scallions and cook until you smell it. Add chicken and cook until brown on all sides, about 8 minutes. In a separate bowl, mix sauce ingredients. Remove the cooked chicken from pan and set aside on a plate. In the same sauté pan you used for the chicken, sauté the broccoli and cabbage for about 10 minutes. Add in the peppers and cook until they are until tender. Add the chicken and the sauce back into the pan. Cook until sauce is incorporated and thickens slightly. Add cashews. Serve with cauliflower rice or regular rice and Enjoy!